Indium Corporation will feature its new technology platform using SACm™ solder paste at APEX March 25-27 in Las Vegas, Nevada. SACm™ is a high-reliability solder paste that increases the drop-shock performance in portable electronics by 800%, without compromising on thermal cycling. SACm™ is doped with manganese and contains less silver than other Pb-free solder pastes. The manganese provides increased strength and the reduced silver content provides a more stable cost structure, especially beneficial for cost-sensitive applications. The platform consists of Indium8.9 Series solder pastes using Indium Corporation’s patent-pending SACm™ solder paste technology for board-side interconnect, and SACm™ solder balls (spheres) for package-level interconnect. Indium8.9HF halogen-free, Pb-free solder paste is one of the standard flux vehicles for SACm™. Indium8.9HF provides excellent soldering performance under high temperature and long reflow processes. It offers unprecedented stencil print transfer efficiency to work in the broadest range of processes. Indium Corporation will be exhibiting at booth 1977. 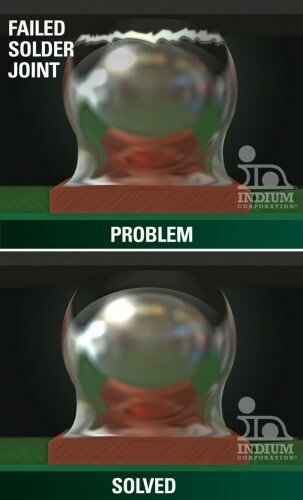 For more information about Indium Corporation’s SACm™ solder paste, visit www.indium.com/SACm or email SACm@indium.com.